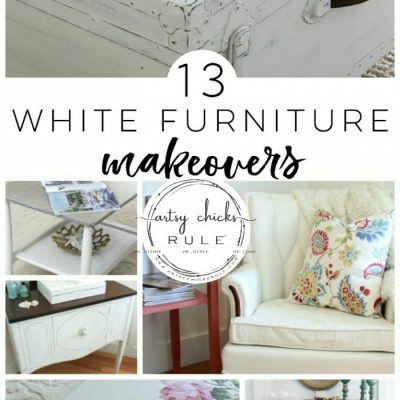 I am so excited to be teaming up with several of my blogger friends today to bring you some fun “love & romance” themed furniture makeovers. 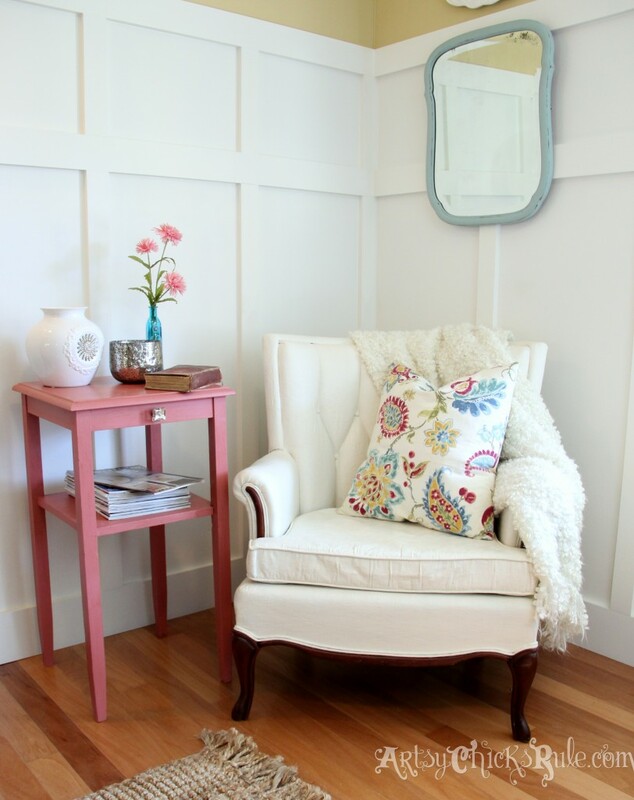 Mine is a thrifty french chair makeover with Chalk Paint and a cozy little romantic reading nook I created with it. Theirs will be linked at the bottom of this post. Don’t miss em! I just adore French styled furniture. It’s so romantic and sweet. French country coastal…that’s my style. With a bit of eclectic thrown in for fun. I’d been wanting to create a cozy little reading nook in the corner of my Family Room since I moved the TV. So when I came across this chair recently I knew it had to come home with me. Well, actually, it is a pretty color, so not too bad. Just not my style. 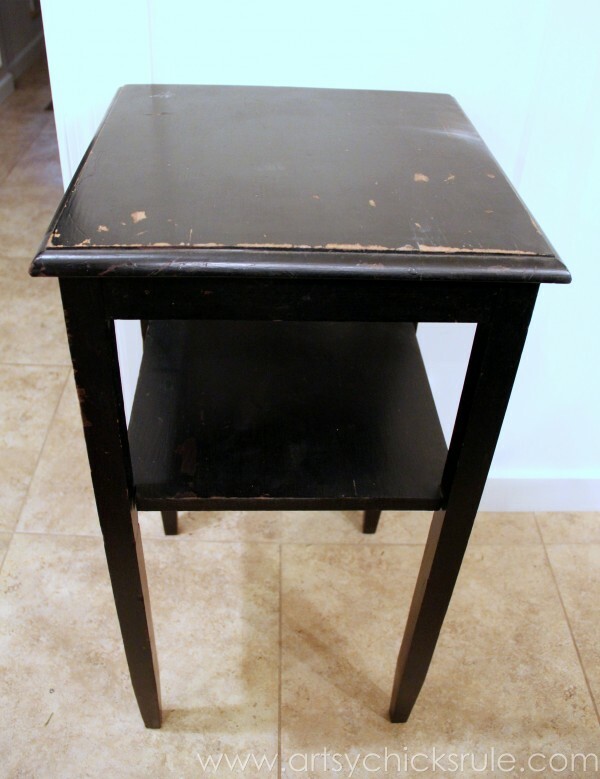 But this is the “after”….as in after I gave it a big ole makeover with Annie Sloan Chalk Paint & Minwax PolyShades. If you follow me on Instagram you’ve already seen it. I post things I’m working on there, in “real time”, long before they hit the blog here. The chair was a steal at $25. I scrubbed it very well before painting with OxiClean (no affiliation, it’s just what I decided to use). And ya know, once painted AND sealed with wax…it will be, well, SEALED. But I cleaned it anyway. 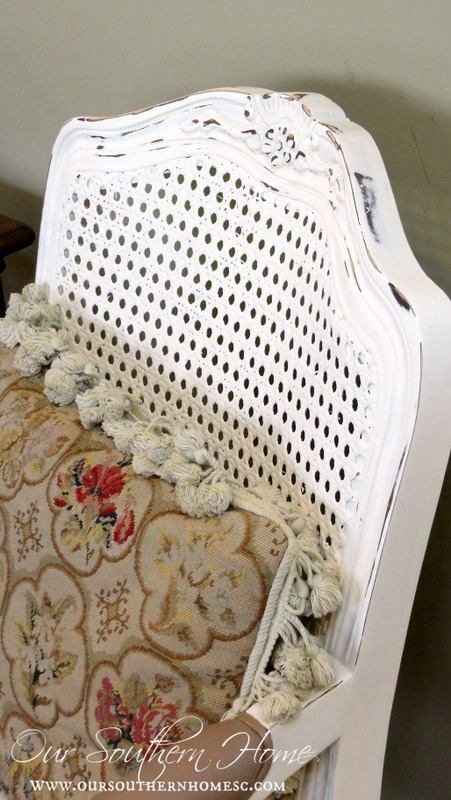 And again, here how my french chair makeover with Chalk Paint looked when I got it. Not completely awful. The color is not bad but I don’t love the “shimmery-ness” of it…or the floral accents. And you guys know how I love to paint. Anything and everything. I’ve painted it all…. from metal bowls to lampshades to porch pillows! So why not upholstered furniture? So I did. And it turned out fabulous! I had to replace the foam cushion in the seat because it was hard……as a brick, hard. Definitely needed replacing. 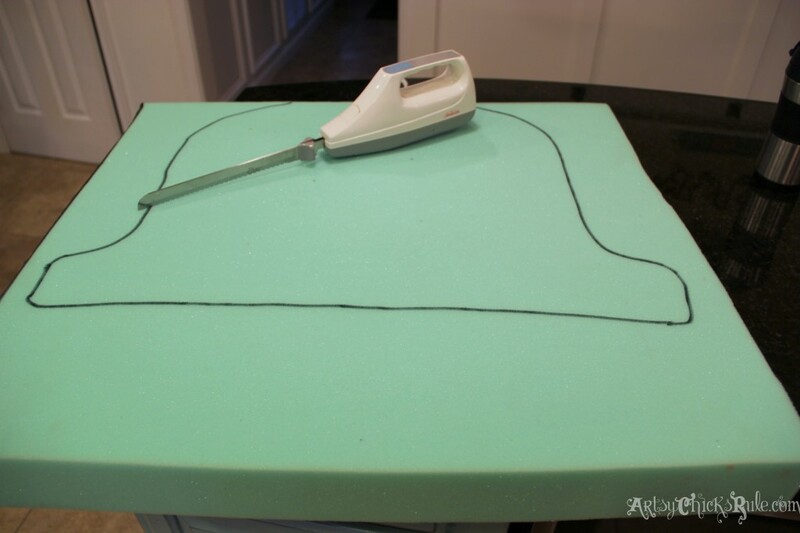 I bought the foam at JoAnn’s (which was 50% off, plus coupon) and traced around the edge of the cushion. …in the color that I thought I wanted it. Yes, I changed my mind. And no, not after I had only painted what you see above. No, I painted basically the ENTIRE chair with one coat (thank goodness for that!) when my brain decided to go in a different direction entirely. Story of my life, I tell ya. It’s never boring around here anyway. So….I washed off all that paint. I know, what a waste but, oh well. Really, I could have spared you this little detail, you know. 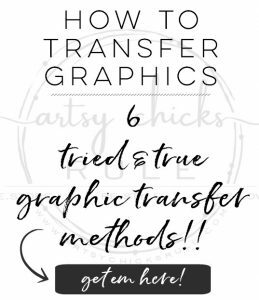 But I want to be up front and honest about the things I do and share here on the blog…because I am sure you guys have “oops” moments too, right? 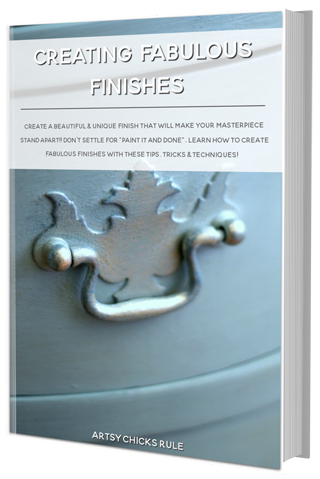 Here is how great working with Chalk Paint is…. I washed most of it off pretty easily. NOTE: When painting fabric with Chalk Paint, it’s best to wet if beforehand. You can mist with a spray bottle or use a wet rag to wipe over it. Also, you will want to thin the paint some with water. Don’t have an exact here because each of the paints are a little different. Just know that it needs to be thinned some when painting fabric for best results. 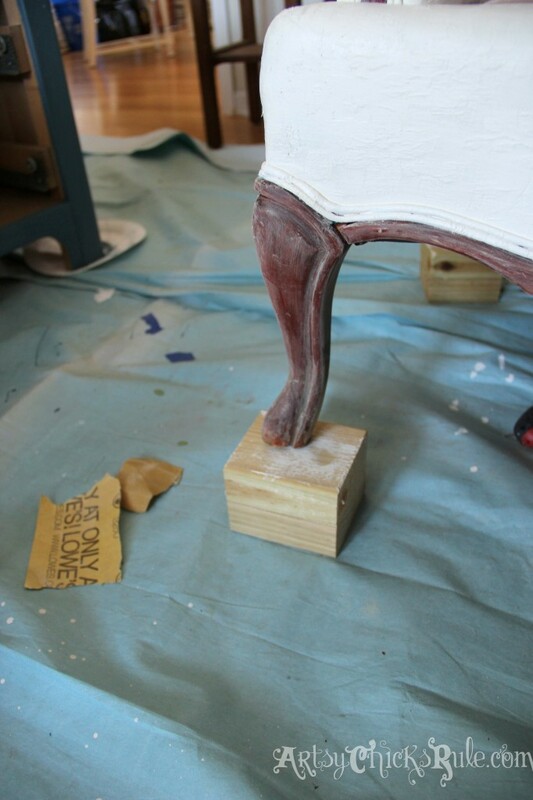 Check it out the beginnings of my french chair makeover with Chalk Paint right there y’all….. I did 2 coats with a few extra strokes here and there to cover thin spots. It went on and covered really well. The wood trim was looking a little rough so I decided to freshen it up with some Minwax PolyShades in this color. I love how easy it is to freshen up old, dingy wood with the PolyShades. After the chair was dry, I sealed the upholstery with Annie Sloan Clear Wax. It ends up feeling “leather-ish” to me once finished. Now I love the floral accents in the fabric. By the way, the paint color(s) I used were a blend of Pure White (heavy on this) and Old White (light on this). This is my go-to “beachy” white as of late. I LOVE this shade. Oh…and I’ll fill you in on the little table(<–you can see it there) you see here in the photos very soon. 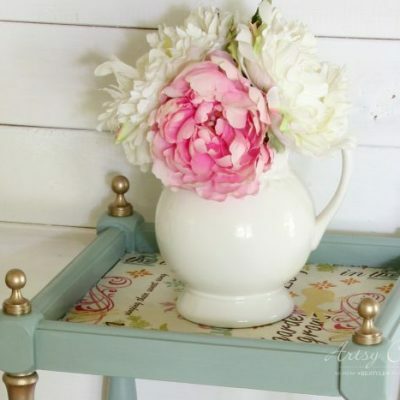 It’s a thrifty Chalk Paint makeover too. 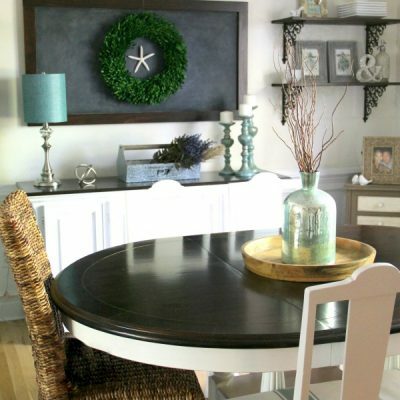 As a matter of fact, the mirror, table and chair were all thrifty finds….and all painted with Chalk Paint®. Old, dated, dingy and uninspiring –to– cozy, romantic little reading nook. Think you’d try painting a chair like this? Be sure to check in next when I share how I gave this little cutie a makeover! UPDATE!!! See it now, here! 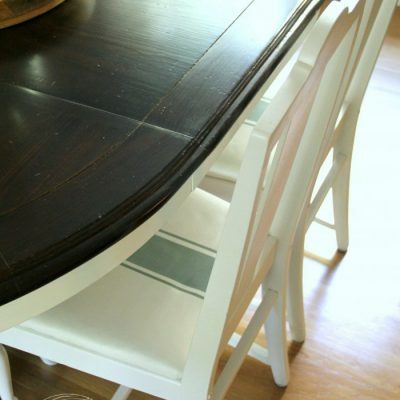 Want to see even more “before & after” furniture makeovers? Click here. Here’s a few teaser photos for my friend’s makeovers for ya! Click the links to see the rest – and- all the details of each one. One of my favorite color combos…pale blue and white. I can only imagine how great the rest of it looks! So loving the distressed whites. Can’t wait to see all of it! 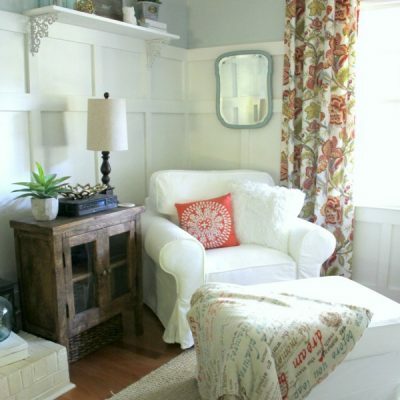 Ohhh pretty fabric and more of that fabulous distressed white…wonder what the rest of it looks like?! That knob is gorgeous…and so is the paisley top. I can’t wait to see the rest! Nancy, You inspire me to get some painting done! I’m new to using milk paint and truly find it addicting! 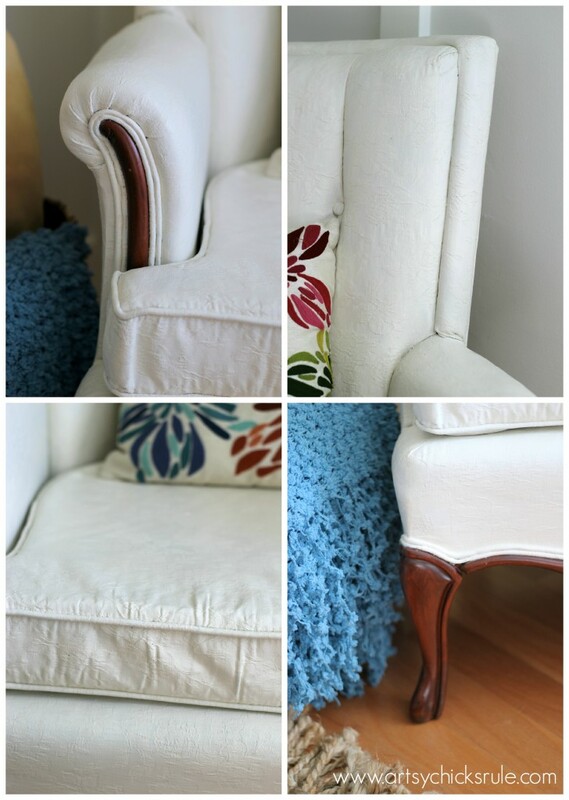 After reading your tutorial Thrifty Chair Makeover I want to tackle my Ethan Allen wing back chair. I must admit, painting fabric scares me … big time. Is it comfortable to sit on and how does one clean painted fabric surfaces? Don’t you just love all these questions? Try painting a small pillow first and sealing with wax. Then see if you like the feel of it. I will tell you, the starting fabric is a factor in the end too. I’ve painted outdoor fabric, indoor pillows (2 different types of fabric) and this chair. All came out a little differently. Thank you for your kind response; you are correct I did mean to reference chalk paint. The chair I have in mind is used seldom, although I will do as suggested. … Pillows first! Thank you for this wonderful blogg you provide your followers. 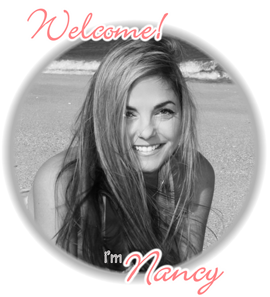 Nancy, what a great tute – and so inspiring! I have some family furniture (read: old) that I have wanted to redo, but reupholstering by a professional would be expensive for me and this seems doable. Question: Would the chalk paint work on a velvet-like fabric? Thanks Stephanie! It’s one of my favorite pieces actually! :) I have not done anything “velvet-ish”. I’ve done outdoor fabric (worked great), pillow fabric (great), silky pillow fabric (good, but not as good as the other fabrics). This white chair had a bit silky fabric too and turned out fine (and I do love it) but maybe didn’t take the paint quite as well as the fabric with a larger weave. I did another chair recently that I will post about next week. It turned out great and had a different fabric (more like the larger weave pillows) I think, in my experience, the Chalk Paint works best on that type of fabric. Velvet…not sure. Is there somewhere on the chair (maybe at the bottom behind and below where the cushion sits that you can do a little test spot? I have just wanted to ask the same question about velvet fabric! Did you try it? How did it turn out? I do have a problem finding the right paint, I live in Europe, but maybe I will find something similar in my local paint shop. Please be so kind and say me how did the velvet fabric pass the painting test! 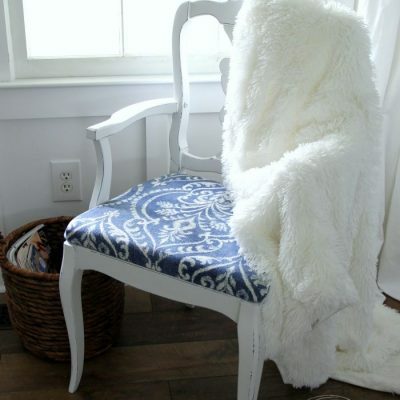 I recently saw an Annie Sloan painted chair and it was not so great looking – The chair itself had tufts and character but I don’t know if it was the paint color they chose or the texture of the fabric, but I wasn’t a fan. Do you really like this and are you going to keep it and use it? I keep toying with the idea for my own personal use but don’t want to purchase a chair and feel like I did when I saw that one in person. Anyway, try it on a small pillow and see what you think first! Hope you are having a great week Trisha! Thanks Christy! :) It’s my new favorite little spot in the house! …for now anyway! ;) So ready for Spring too!! 60’s here! Yay! I love how this chair turned out Nancy! Looks totally awesome. I have a couch my MIL gave me a few years ago and since I don’t sew I have been trying to figure out how to reupholster it. Now I have found the solution…PAINT it! Can’t wait for the weather to break some so I can get started! Thanks for the post. Thanks Sheila! Yes, I am so very happy with how it turned out. I always tell everyone to go by the thrift store (or if you have an old one already) try painting a small pillow and sealing it with the wax, first, to see if you like the feel and how it turns out. It ends up feeling like leather to me. I have painted 4 different types of fabric so far and all ended up just slightly different…so keep that in mind! I’m enjoying these 60’s!! :) Hope it stays! Have a great rest of the week Sheila! Thanks Patricia! Yes, it’s crazy but you can paint it! Great way to change up an old piece! Yes, I sure can (and I’m going to edit my post because I forgot to include it on this one) I take a wet small rag and wet down the entire chair. (well I had cleaned it so it was still wet from that…either way, wet it) I then mixed my paint with some water and started applying it to the fabric. That’s it. Let it dry well then wax. Thanks Therese! :) Yay!!! It’s addicting! Can’t wait to see what you paint! Amazing! You rocked the chair! 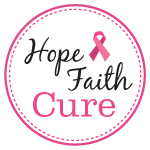 Wow – – how great is this!! 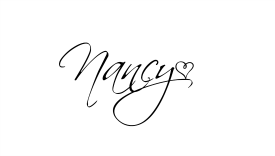 You did an awesome job Nancy. Thank you Katy :) It was really fun to do too! Thanks Kathy! Oh you need to!! It’s fun…and easy really! (different fabrics react differently though I have found) Try it on a pillow first! I’ve painted fabric for signs I’ve made with drop cloth, burlap, old placemats. But I’ve never tried my hand at something like this. I guess I’ve never believed it would work out that well. And I use chalk paint regularly. Still, it seemed a little… strange I guess. But now I see with my own eyes what a beauty your chair is and I’m thinking it might be worth a shot. :) And thanks for talking about the wax on this because I guess I wouldn’t have thought to actually use wax on the fabric. Anyway, it looks great! Unbelieveable difference! I am completely inspired by this makeover!! Nancy, you are amazing. Thanks for sharing. Pinned and shared everywhere!! P.S. You make everything look so darn easy! Thanks Karen!!! I am in love with it. I have another I am going to paint in a Duck Egg shade…(lighter). Might start it this weekend! I do love the whites. If I had another house to decorate it would be all whites, white slipcovers, beachy white furniture with touches of color here and there. Oh, I would love that. Wow! I can’t believe you painted it! I’m always so nervous to paint a whole chair. I painted a cushion and it definitely isn’t the most comfortable. However, I didn’t use wax on it. Definitely going to have to try this! Thanks Megan! :) Oh yes, you have to use the wax. The wax actually softens it up a bit. It’s kinda crunchy without it! Love your chair and your table! Yours is my favorite of all! Thanks for taking risks and having good taste. That blows me away! The difference is just out of this world! The wax seals it makes it feel leatherish, how does it stand up to the test of time? I think I want to do this, it’s so crazy cool! I have a chair and ottoman in my bedroom and it is just like new but is a large flower print and I need a change. Does it take a long time for the paint to dry? Does it soak into the materials underneath? Love your chair. Did you just do one coat of wax? Can you tell that I am a little nervous? Yes, I only did one coat of wax. Don’t be nervous! Just try it on a small, old pillow or something first to make sure you like it though. Thank you Christy! :) Yes, you do!! I came across 2 chairs on the same day (that were acceptable!! lol ;)) I was planning to *try* to re-upholster (laugh) the other one but I’m very highly considering painting it too! Hi, I just came across your blog with the recent post on your beautiful white kitchen cabinet paint job, but have to let you know I love this look. 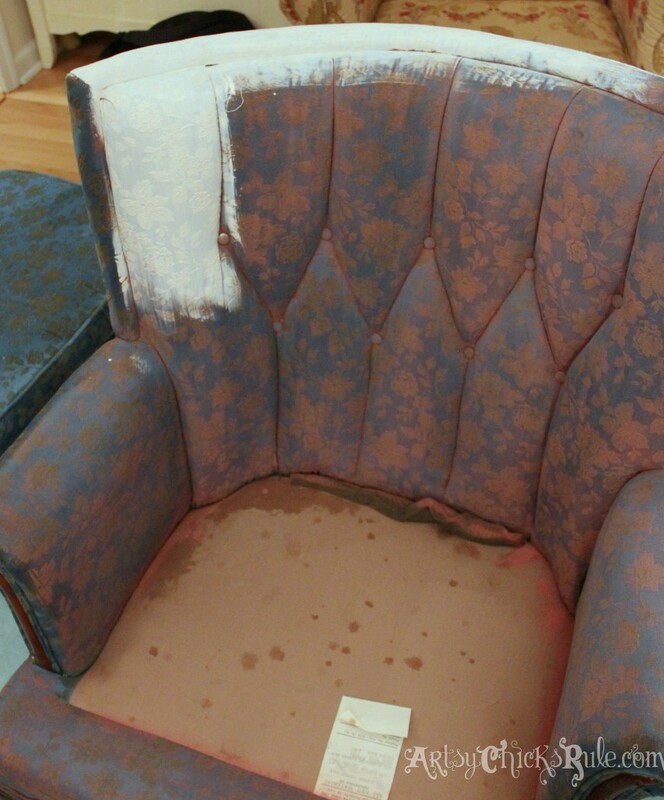 I’ve seen people paint upholstery with the ASCP before but always wondered if it will get dry and crusty over time. I’d love to hear how it holds up. But as a confirmed non-fan of sewing, I can’t begin to tell you how cute it looks and how it makes me laugh-not in a bad way, but you know… “if they can’t take a joke..” way. Gonna try that Mixwax product too. So now that it has been a few months, how is the chair and paint holding up? I have two little chairs I got for a steal (15 bucks each!) that we want to use in our office, but I would need to reupholster or paint them. I just want to be sure it won’t start flaking off in a few months. Any tips? It’s a chair no one really sits in so it’s hard to say! ;) From what it has been sat in…doing great! Best tip I can give you is to be sure you water the paint down a bit so it saturates the fabric, not lay on top. If it lays on top, it will crack. WOW this is an incredible makeover, love the chair!! I’m speechless. 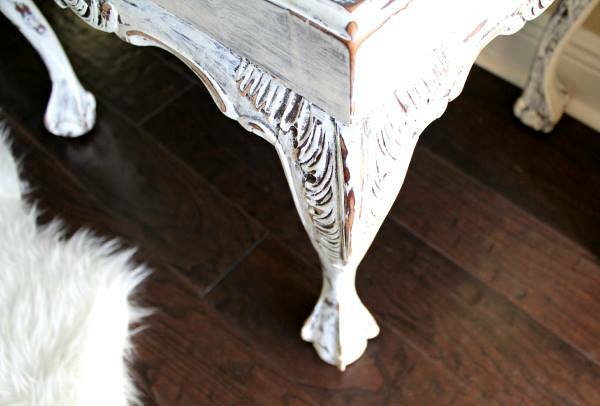 This looks absolutely stunning and to think it’s chalk paint is beyond me! I can definitely relate to changing your mind during a project, haha. Of course I am so indecisive it sometimes takes me waaaaaay too long to even start on a project. Pinned! Aww thanks Katie! :) haha…glad I am not the only one. But I seem to change mine constantly! Seriously Nancy, it looks amazing. I love it!! I painted a similar chair once (using regular latex) – in bright orange for my Kindergarten classroom and hot glued big colorful buttons on top of the traditional button tufted back. It turned out really well- but is a bit rough feeling. I bet the chalk paint and wax is a way better solution. 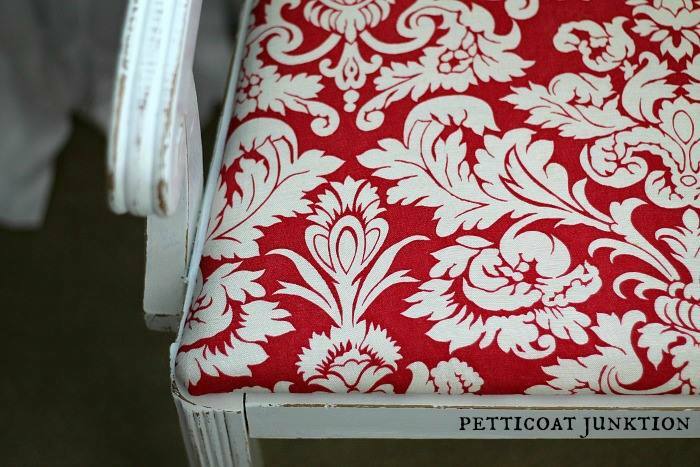 PS- what is the amazing fabric called on the pillow on your chair? Did you make that?? Hi, just found you and was wondering if another brand of wax could be used. I have Johnsons paste wax. Would that work you think? I am now following you. Thanks for your help. As far as on furniture goes, I would say yes. Others have used it with good luck over the Chalk Paint (I have not used that particular wax over Chalk Paint myself though….I have tried it in the past for other paint/furniture and couldn’t keep using it because of the strong smell) I just recently tried a new wax called Howard’s Citrus Shield Natural Wax. It smells great but the verdict is still out on how well I like it for furniture. 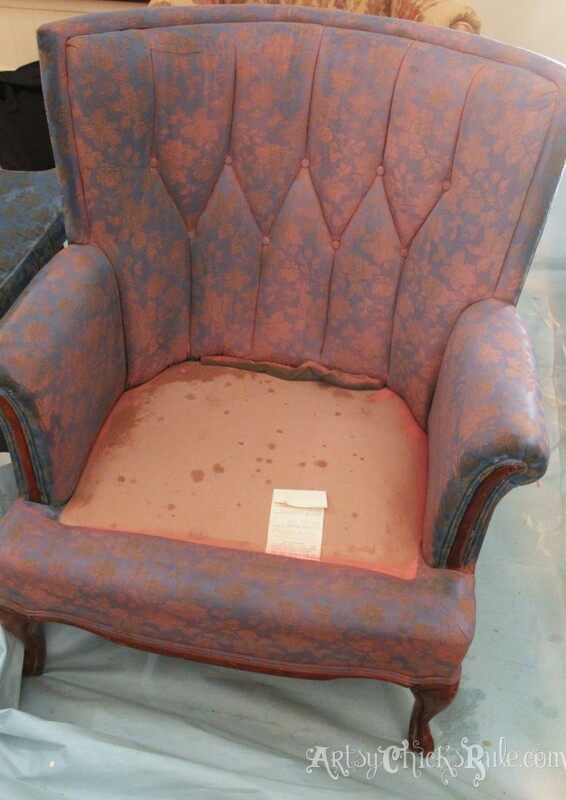 ;) But as far as on the upholstery…I have only used Annie Sloan’s wax. Literally on Craig’s List looking for my next victim, -er next piece of furniture. I want to try painting something upholstered now too! OMG I feel like I developed ADD because of the projects I juggle too! Wow…I really think it’s because I can’t just sit there and watch paint dry – literally. I have to DO something else. Haha! Your AS chair make over is awesome, looks great. 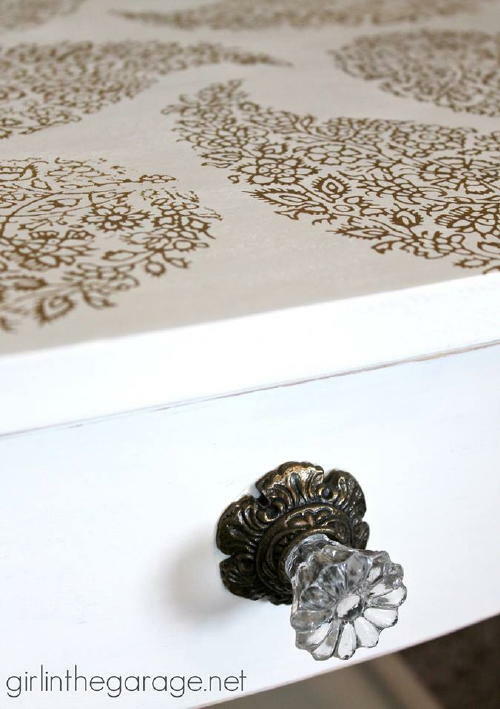 I have spray painted fabric before but have never tried chalk paint on fabric. Thanks for the great post and large pictures and every detail of your work. Oh, your crafty side is amazing. Do you ever sleep. Lol. Loooove the chair!!! Can you please share with me where to find the paisley throw pillow on your painted chair?? Thank you !! I got the pillows (I have 2) from TJ Maxx about 4-5 months ago. I LOVE those pillows! I have looked for more every time I go back and have never seen any. But you never know!! Wow! Painting that chair with ASP is amazing! Who would have ever thought one could paint an upholstered chair with paint? Hey, I have two wing back chairs, wished you lived closer; I’d hire you to do your magic on my burgundy chairs. I called the man that does my upholstery pieces and he said it cost as much for a tailored white slipcover as it does him to upholster one..and talked me out of it. Thanks Betty! :) Aw, yes…you could try it on the underneath side of the cushion to see if you liked it before you went ahead with it! I have a question about the cushion. I hope I didn’t miss this above. If you recovered the seat, how did you match the two colors? Did you paint the cushion too? In the pics it looks like a perfect match! I didn’t recover it…I replaced the cushion inside the cover and painted the whole chair the same color. :) The cushion that was inside the seat was hard and falling apart. 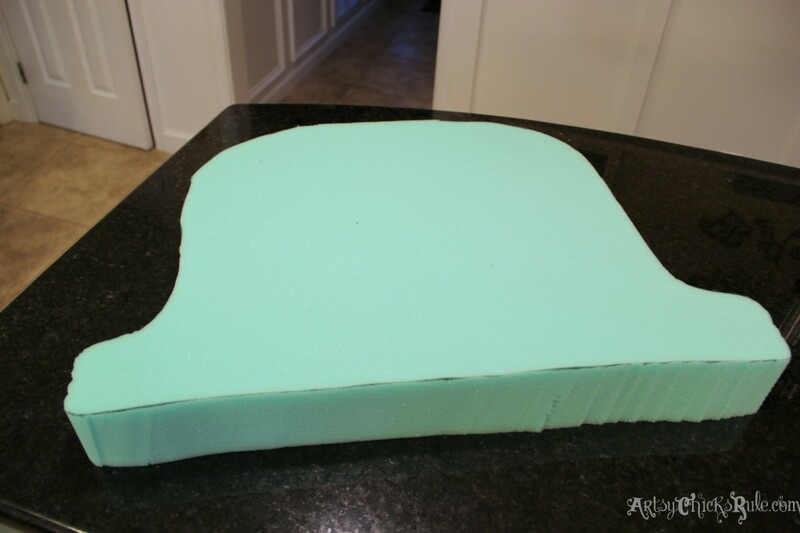 How do you put the new foam in the seat cushion? Do you have to cut it open and sew the seat cushion after? Not sure how you did it but you sure did a nice job! Also, does the wax rub off on clothing? You said it felt leathery, so I was wondering if it could have any kind of effect on other fabric. 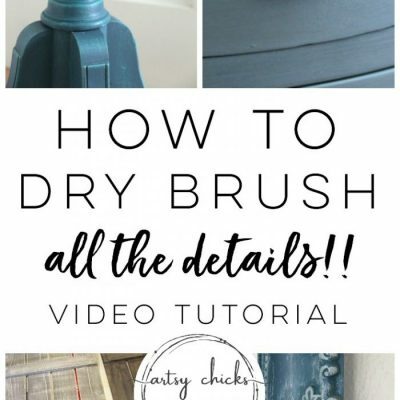 I have never used chalk paint or wax so I’m not in the know on any of this. Nope! :) Not in my experience anyway. Once it’s dried (cured) it’s good to go! I think, for the most part, the fabric will end up with a leather-ish feel because of the wax finish…no matter what fabric you start with. However, I did just do a different technique on a pillow cover and it’s very soft and pliable and not as leathery feeling (even waxed). I’ll post about it soon! 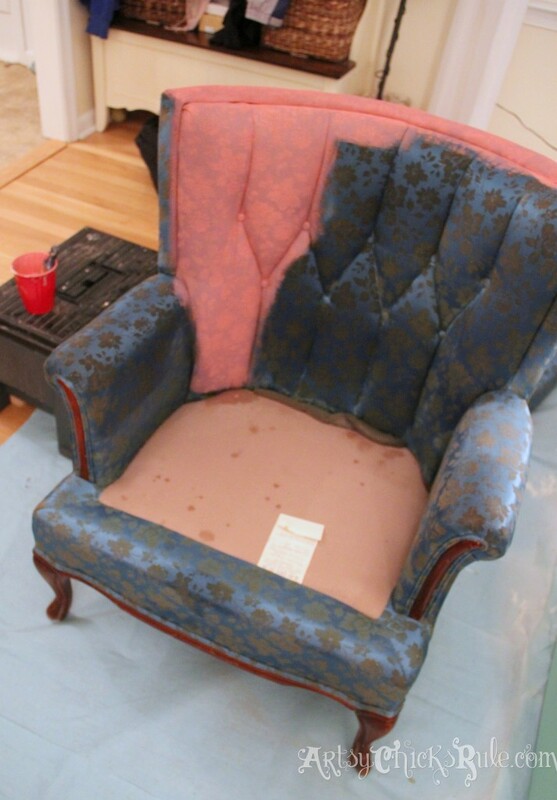 Was one liter of the paint enough to do the entire chair? Oh yes, I didn’t even use that much. You will pour some out and mix a bit of water in it so it really goes a very long way! Hi, love this idea so much but right now I’m really loving doing lots of painting with milk paint. 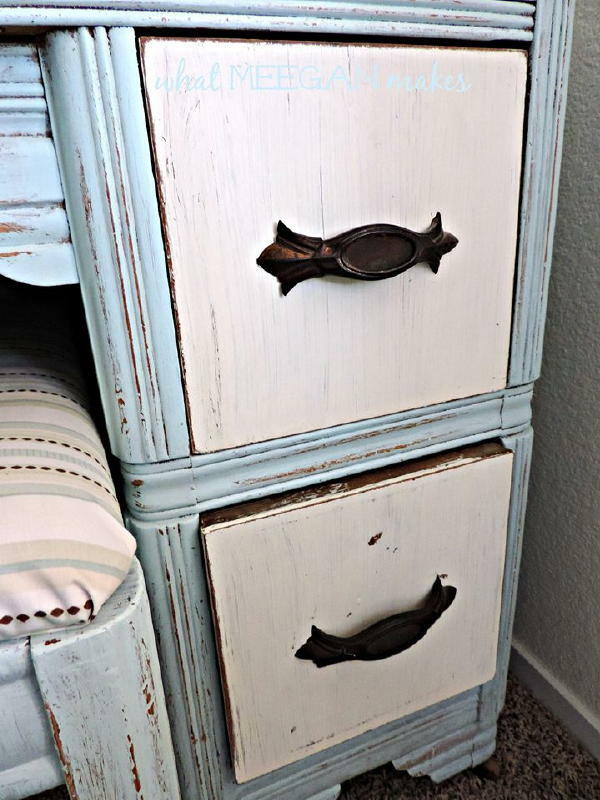 I was wondering if you think something like this would work with milk paint as well? 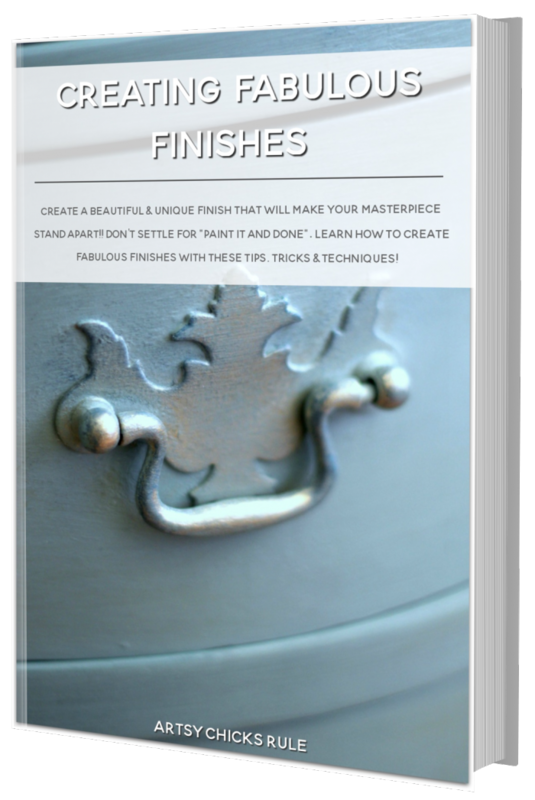 I know it works so well on unfinished surfaces I thought it might do well on upholstered furniture and could still be waxed. What do you think? Or have you by any chance tried it? What dit you paint with? A regular brush? And how long did you wait between the paint coats? Yes, I just used a regular brush but one that was sort of “thickish” bristled. That helps to get the paint down into the fabric. I don’t remember an exact time but once it is dry you can paint again. You can feel it and definitely tell it is dry. It takes a bit longer than wood furniture. I have a question about the wax- does it rub off on clothing? If this chair were used fairly regularly do you think that would be a problem? I have a chair I painted and it’s stiffer than I’d like so I was thinking about waxing it but I’ve never worked with wax before so I’m a little nervous…. Thanks! It really depends on the size of the chair and the type of fabric (some will “soak” up more than others) You would have more than enough with one can. No, not 1/2 to 1/2 ratio. More like 1/3 to 2/3 ratio (water to paint). Liquid enough that it does not “sit on top” of the fabric. Sanding…only after the final coat to “soften” it up a bit. Not much. Nancy Help!!! I used my own mixture of chalk paint to paint one of the cushion covers from a dinette and now it’s stiff from the paint. I thought that I was using the correct method with the paint. 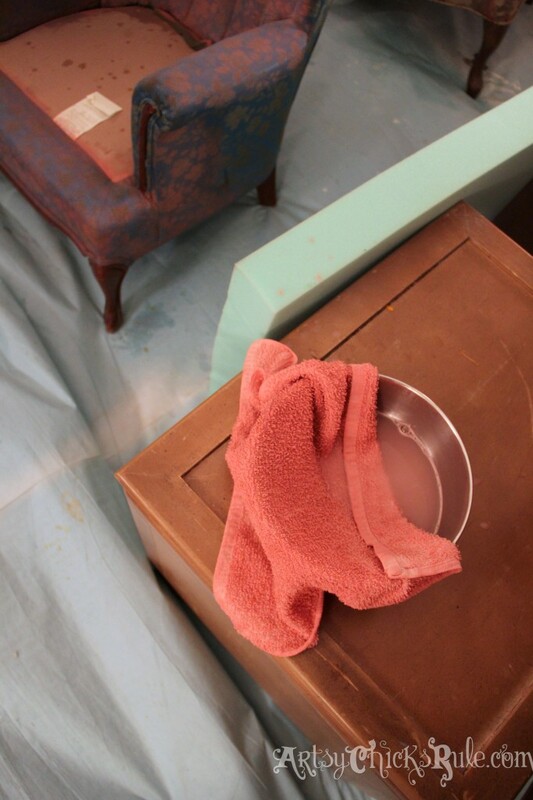 I sprayed the cushion with water and also dipped my brush in water before I dipped into the paint. Is there any was to rescue the cushion cover? Love how your reading chair came out. I really want these cushions to look great in my RV. I’m so sorry I didn’t respond sooner. I have been away on vacation. Do you mean you mixed something like latex etc to blend your own CP? If that’s the case, I am not sure since home made Chalk Paint and Annie Sloan Chalk Paint does have different properties. If you used latex in your mix, it will probably be hard-ish since it typically has a ‘rubbery’ finish. You could try waxing to see if that softens it up a bit but I am thinking it probably won’t. So sorry I could be more help!!! Thank you for taking the time to answer my call for help. Anyway, I’m going to recover the cushions. I also ended up not liking the color so all in all it’s been a learning experience. You are welcome Mary…and thank you right back! 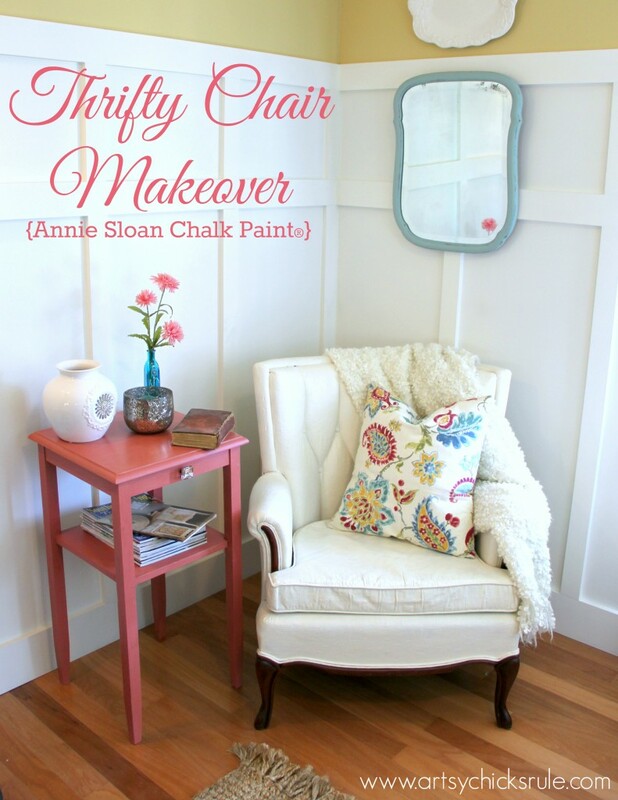 I loved this post on using Annie Sloan paint to paint an upholstered chair. I used Duck Egg to paint a wing back chair I bought from Salvation Army for $24! I love it! I was wondering if you could post a picture of your reading nook with your chair. I would like to see how you’ve arranged the furniture to allow for such a nook. Thank you! The chair and all your other projects looks amazing. 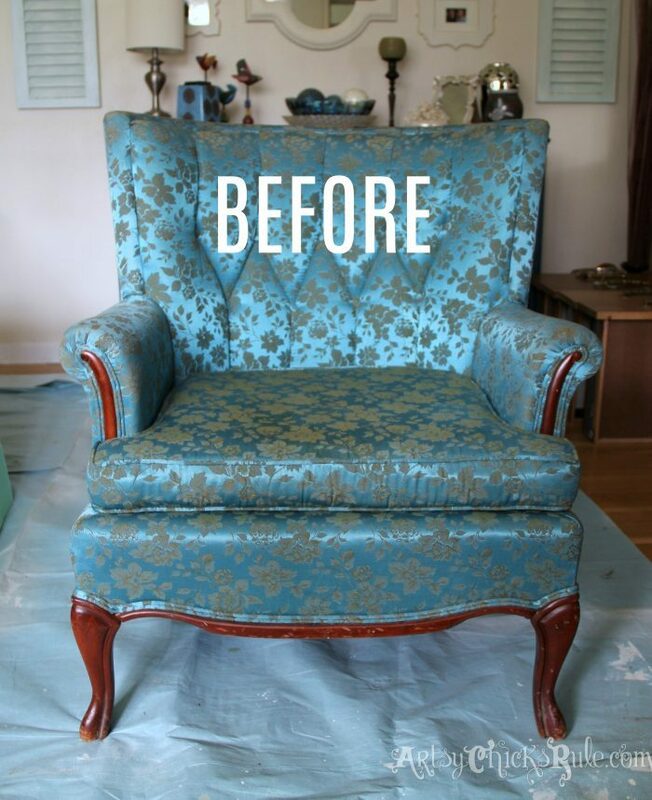 How much paint did you use for this wingback chair? My boyfriend has a wingback and fabric looks like wool do you think chalk paint would work for that kind of material? Or micro suede? I used somewhere around 1 – 1 1/2 cups of paint. (with water added to that) I’m not positive how that will be on the wool. I can tell you, most come out feeling sort of leather-ish. The pillows I did outside (outdoor canvas type fabric) is more “canvas-y” feeling still though. AND, I will note that in the year and a half since I did them…they are now softer than when I first did them. That is a fun surprise. I will be interested if the same holds true with the chairs! Love the makeover! Love your blog! I just came across it on FB, been here an hour now, you are inspiring me all over the place! This is a great idea! I’ve recently bought a similar chair with the intention of reupholstering it as soon as I finish the two I’m working on now, but this looks much simpler and I’m curious about giving it a try. My only concern would be whether or not it would be easy to keep clean with my young kids around. Have you spilled anything on something you’ve painted yet? If so, how well did it come clean? Would the paint wash off with a wet rag during spot cleaning? How does the paint feel against your skin? is it hard? Does it feel like original fabric? No it does not feel like the original fabric. It ends up feeling like “pleather” or leather-ish. I don’t see why you couldn’t just repaint it white. Just be sure to water the paint down a bit like noted so it will “soak in” to the fabric and not lay on top. You don’t want it laying on top…it will crack. Do you think this would work on cellular shades? How much does the paint soak into the fabric? I think it should. (hard to say without seeing them though) You would want to water the paint down a good bit though. I have painted lamp shades and I would think this may be a similar fabric/process. If you have an area that is not seen somehow…you could test it a bit first. Wow, you are a magician. the chair looks so gorgeous now! I’m not positive as I didn’t measure but since this application requires the addition of water, you will have more than enough with one can. Hi Nancy! I just found your blog via Pinterest. 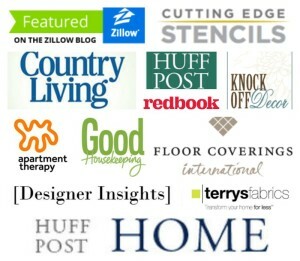 I love your blog and your home is beautiful. I have been intrigued with the painting fabric but a little scared of the end result. Your chair looks great and your tutorial is very helpful and inspires me to try it now. Can you please tell me if you have to be concerned with the paint cracking and flaking off the upholstery? Yes, that can happen. It all depends on application and the type of fabric you are using. I have found the paint penetrates some fabrics better than others. I haven’t had any trouble with most of the things I’ve painted but the “slicker”, tighter woven fabrics will sometimes flake a bit if the paint is not watered down enough to penetrate those fibers. I typically would not paint something I used every single day. Occasional use should be fine! Everyone loves that pillow!! ;) I’ve had so many inquiries about it. It is a fabulous fabric and I snatched both (I have 2) up at TJ Maxx last year. I look every time I go back to see if they have more and I’ve never seen any. But that is where they came from. Thank you! :) Yes, painted upholstery can feel a bit stiff or crusty. A light sanding before applying a coat of wax (which also helps to soften it) will soften it a bit. It will end up feeling like leather. 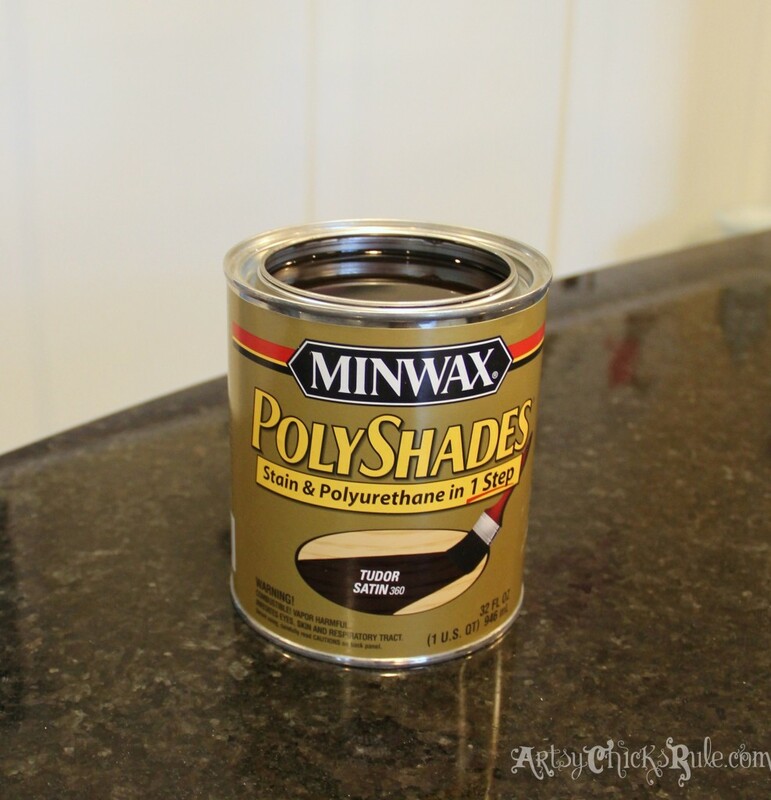 Yes, the Minwax product is great too! 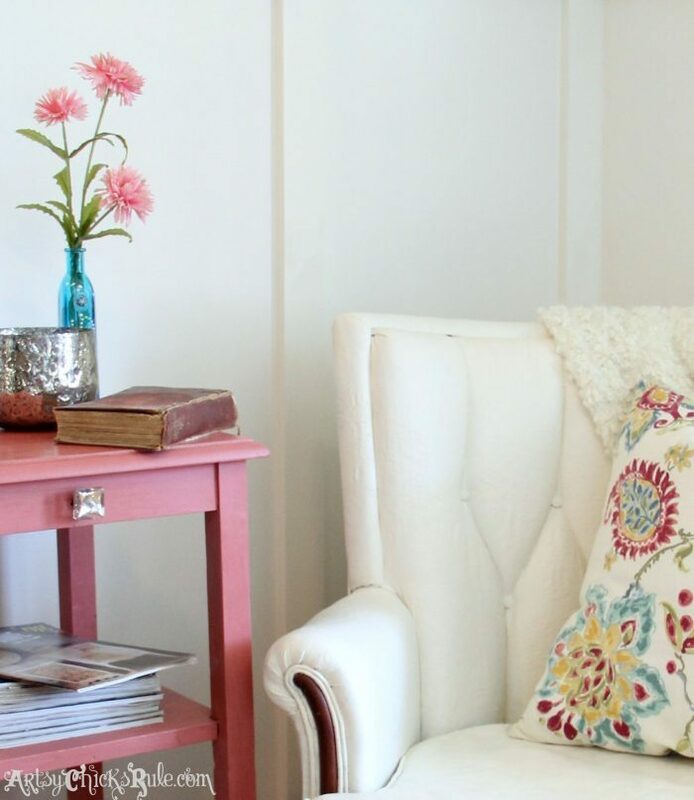 I am getting ready to paint a little cute chair that I have had for years…and I have been all over your site checking out your painted fabric! Awesome job :) Can’t wait to get started! Thank you for sharing! Aw thanks Brooke! :) I saw the chair on IG! Have fun!! Wow, this is absolutely gorgeous! 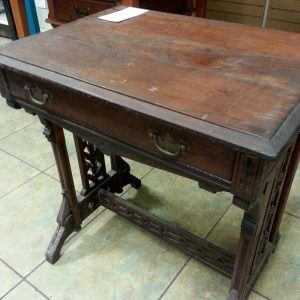 Looks like a real antique, would never guess it was DIY. I may have to look into those chalk paints, I didn’t know they made it so easy to redo upholstered furniture. Thank’s for sharing, I am inspired! Hey, I am absolutely in love with your chair! I’m actually thinking of painting my headboard the same colour but wanted to know if it gets dirty very quickly? Hello what do you think about painting a dinette chair that is used daily ( multiple times. It is a firm cushion. I think the fabric paint holds up. You can’t wash it out once it’s in. It’s like the T-shirts, that you wash and wash, it becomes part of the fabric. I was painting with Reclaim paint which is similar to this, and a spot on my t-shirt will not come off. It’s there to stay. The only way is to try to make a hear tor something around it to disguiste this. I also dropped some on my Merril shoes. What was I thinking! So I think I’ll paint the shoes, since after 4 weeks that stain is going no where, I may as well and then I’ll have new shoes. Thanks for posting this, it gives me great ideas. I had thi bench in my bedroom, I was planning to slip cover, but this is way easie. I tried Reclaim paint for some old junky furniture in my family room in Nantucket blue and I was floored and they look amazing. It takes weeks to cure though. But I saw the Chalk paint at Ace hardware, and I will try it on my dining room furniture now. I’ve used it on furniture and love it. So far…not so good! I loved the way your chair turned out, so I decided to give it a go on this set of chairs I have been waiting to reupholster. The paint part worked beautifully. I went with a deep dark plum color…they were gorgeous! Then, I waxed them. I’m not sure what the heck happened, but there are patches of white all over the place. They have the look of the texture of the fabric (a thick, canvas-type of material). It’s almost like the wax was too thick and dried white. So, I re-applied the wax and wiped it off immediately, thinking that if I re-saturated the wax, it would pick up the thick, dried pieces. Unfortunately, that ended up taking off the paint, too. So, now I have places where the fabric is (barely) showing though with no wax, places where everything looks fine, and places where there is too much wax and it’s left a white film-like texture on top of the purple paint. 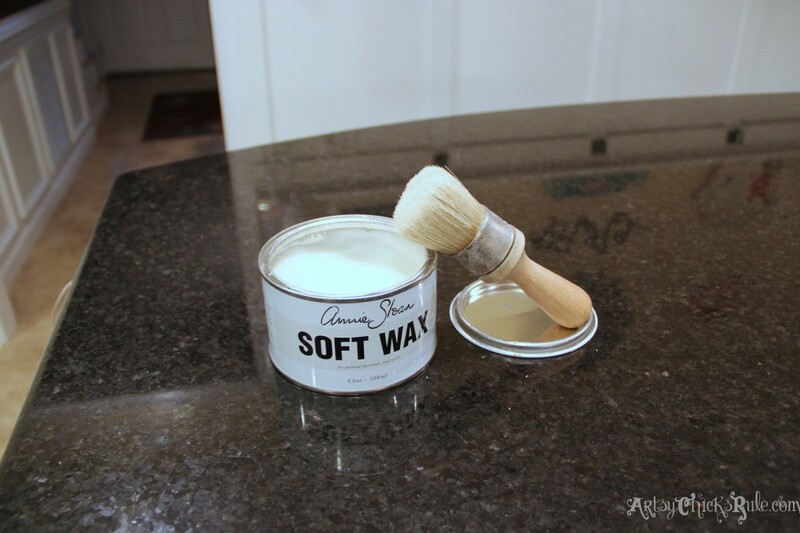 Did you use Annie Sloan paint and wax? If the wax took the paint off when you reapplied, it may be that the paint did not absorb well into the fabric. Sounds as if the paint is mostly laying on top of the fabric. That can happen if the paint is applied too thickly. Unfortunately, I don’t have any real suggestions since the paint really needs to “soak in” to the fabric and now that it’s waxed it will be unable to do so. My only suggestion would be to try lightly sanding the fabric to remove some of the paint and wax and paint again. This time applying a very thin layer of wax. I’m sorry I couldn’t be of more help! I just finished my first fabric chair with a wood frame. I mixed the color and unfortunately did not mix enough. Can you tell me how much paint you used for the chair you did. I do know that I need to mist the fabric and dilute the paint with some water which I did. Also, on the white chair, on the blue chair, how did you paint the white piping. Do you tape the wood? 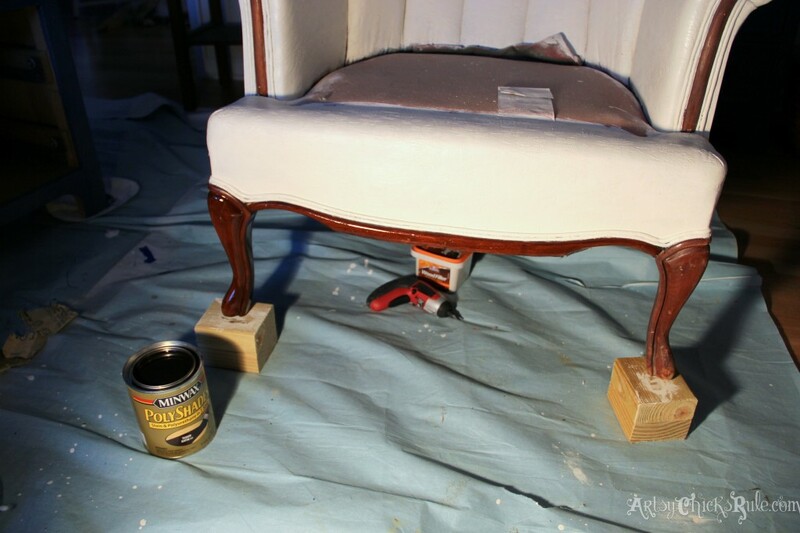 Any secrets to keeping the paint off the wood trim and legs. I’m pretty happy with the way my chair turned out but I think I could do better in the future and I am always looking for helpful hints to make the job look more professional. I am not sure how much paint I used but I think it was about 1/2 a can. Yep, diluted and spray the fabric beforehand. I painted the piping with a small artist’s brush. It was a little time consuming but kept the paint where it was supposed to be. Hi, saw your post and that you washed off the first color? When did you do that? Was it completely dry? I messed up my first round, I didn’t water down the paint enough and some spots are thick and caked on if you will. How did you wash it off, or what would you suggest. This is FABULOUS! You’ve inspired me to work on a chair that is peeling. I have a faux leather chair and it’s peeling badly. I decided to peel off the material and paint the underneath… however, I’m left with a foam underneath! Am I able to paint this, or is it a lost cause?? Nancy, this is gorgeous! I don’t know if I’m brave enough for this but you sure made that chair look comfy and inviting. LOVE it! HI Nancy, I just finished painting a small chair in red and applied wax to seal it. I understand that after rubbing the wax with a soft cloth that some of the colour will rub off and this is normal however I wondered if this will continue to happen down the road or will the wax cure and seal the colour after a week or so? Is this a reasonable amount of time to allow the wax to set? If it continues to run off should I relax the fabric? I meant re-wax the fabric not relax. ?